Hello! I am a fifth year astronomy graduate student and PhD candidate at Georgia State University. I work with Dr. Doug Gies to measure the orbits and determine the fundamental parameters of visual & spectroscopic binary stars. I am currently the president of AstroPAL, a mentoring group for astronomy grad students at GSU. I was also a lab TA for the intro astronomy classes. In my spare time, I enjoy playing tennis, going to music concerts, biking, and traveling! I also teach spin classes at the gym. PhD in Astronomy - Georgia State University, expected May 2020. MS in Physics - Georgia State University, December 2017. BS in Astrophysics - Lehigh University, May 2014. 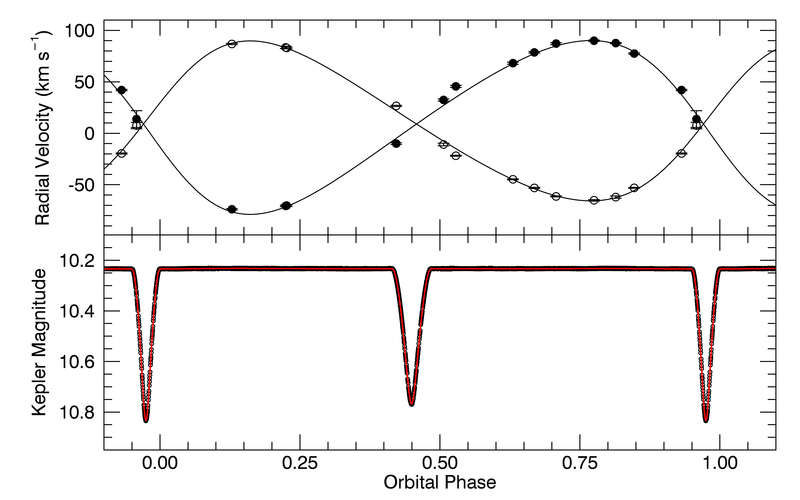 The fundamental parameters of eclipsing binary stars are used to test stellar evolutionary models by comparing the observed and predicted stellar parameters, such as mass, radius and temperature. However, most eclipsing binaries have short orbital periods, which implies that the stars probably interacted in their early phases and are currently subject to tidal forces. So, it is not clear how applicable the parameters of close binaries are to evolutionary models of single stars. The solution to this problem is to expand binary star studies to longer period systems that are widely separated and not interacting. This requires the measurement of a visual orbit to estimate the orbital inclination, which is then combined with the spectroscopic elements to find masses. For my thesis project, we will determine the visual and spectroscopic orbits for 11 double-lined spectroscopic binaries by combining echelle spectroscopy from the APO 3.5m and CTIO 1.5m with long baseline interferometry from the CHARA Array. The visual orbit of HD 224355 from CHARA/CLIMB observations is shown to the right. Read more at Lester et al. 2019, AJ, 157, 140 or watch a video of my talk at GRAM 2018. Eclipsing binary systems showing apsidal motion can be used to test the internal structure predictions of stellar evolution models. 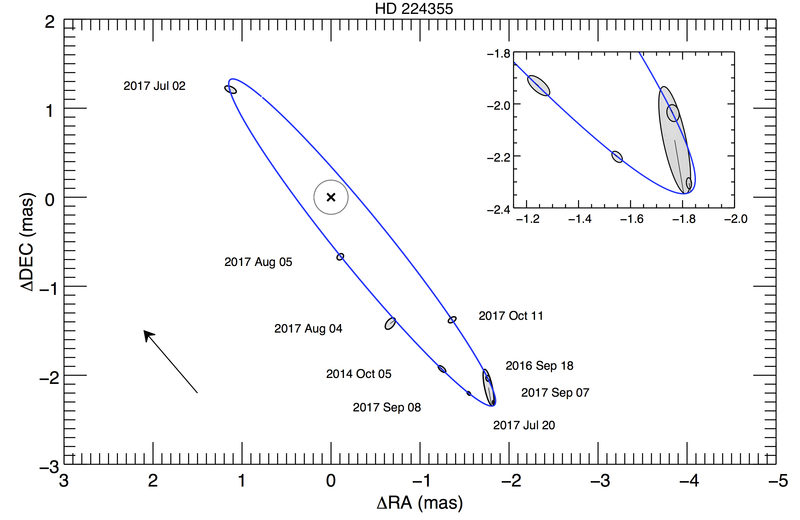 For this purpose, we present a photometric and spectroscopic analysis of the eclipsing binary BW Aquarii, an evolved F-type binary with slow apsidal motion. 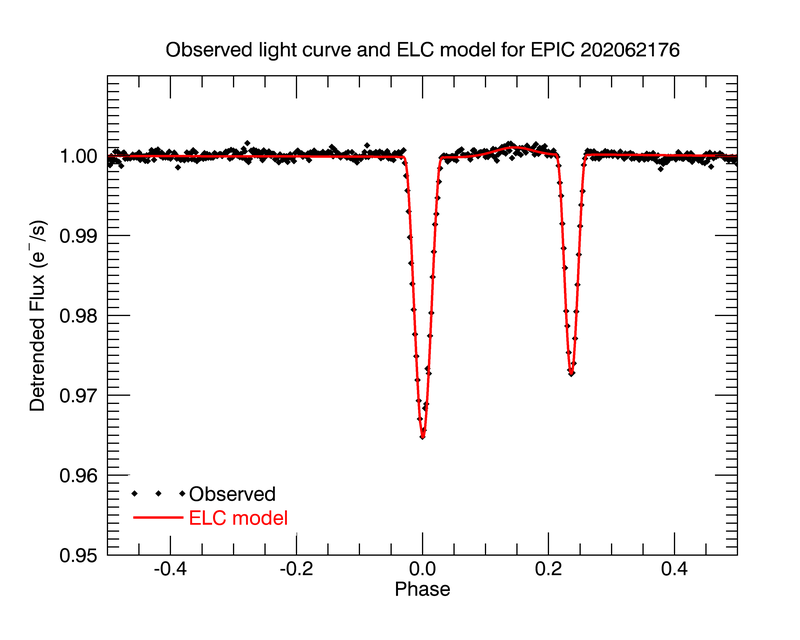 We model the K2 C3 light curve using the Eclipsing Light Curve code to determine several orbital and stellar parameters, as well as measure the eclipse times to determine updated apsidal motion parameters for the system. Furthermore, we obtain high-resolution spectra of BW Aqr using the CHIRON echelle spectrograph on the CTIO 1.5m for radial velocity analysis. We then reconstruct the spectra of each component using Doppler tomography in order to determine the atmospheric parameters. We find that both components of BW Aqr are late F-type stars with M1 = 1.365 +/- 0.008 Msun, M2 = 1.483 +/- 0.009 Msun, and R1 = 1.782 +/- 0.021 Rsun, R2 = 2.053 +/- 0.020 Rsun. We then compare these results to the predictions of several stellar evolution models, finding that the models cannot reproduce the observed properties of both components at the same age. We completed a photometric and light curve analysis of an eccentric eclipsing	binary in the K2 Campaign 0 feld that resides in Sh 2-252E, a young star cluster embedded in an H II region. Because there dozens of stars in this embedded cluster fall within the Kepler aperture, we obtained spectra of the three brightest stars in the crowded aperture to identify which is the binary system. We found that none of these stars are components of the eclipsing binary system, which must be one of the fainter nearby stars. However, these bright cluster members all have remarkable spectra: Sh 2-252a (EPIC 202062176) is a B0.5 V star with razor sharp absorption lines, Sh 2-252b is a Herbig A0 star with disk-like emission lines, and Sh 2-252c is a pre-main sequence star with very red color. I taught both ASTR 1010 and 1020 lab sections, including setting up the lab, presenting a brief introduction, and grading lab worksheets. On-campus observing - ask me in class!